In the Haute-Savoie area of the French Alps between the Chamonix Valley and the Val d’Arly. 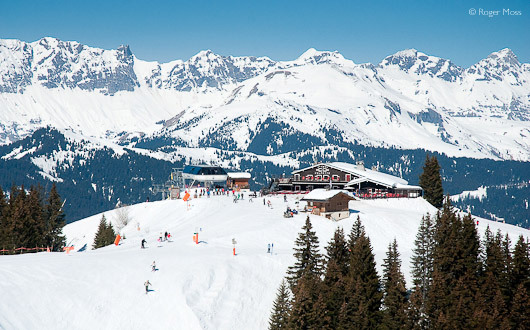 To the north lies the Massif des Aravis, while just across the valley is Megève. Transfers via Sallanches from flights into Geneva are easy, and there’s good road access both from there and from Albertville. 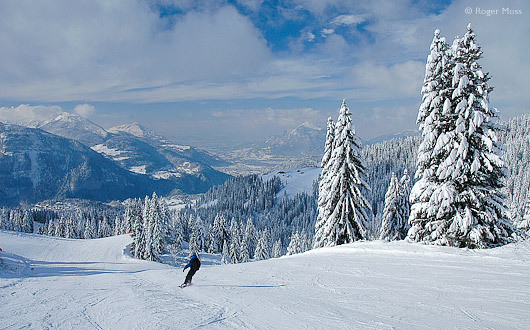 Although a busy route passes through Combloux, the ski area and most of the accommodation lie hidden from view on the mountain, where they remain relatively undiscovered by those focused on big-name areas elsewhere. We think there’s something of the wild spirit of Canadian skiing in the forested runs over to La Giettaz. Very scenic skiing in surprisingly extensive local terrain. Evasion Mont-Blanc lift pass gives access to nearby resorts like Mégève. The skiing on this side of the valley is covered by the Portes du Mont-Blanc lift pass, and covers the linked terrain of Combloux, Cordon and La Giettaz. Pay extra for the full Evasion Mont-Blanc lift pass and you can also explore all that Megève, Saint-Gervais, Saint-Nicolas de Véroce and Les Contamines-Montjoie (the latter accessible by car or shuttle bus) have to offer. Convenient hands-free passes are well worth the small refundable deposit. It adds up to a lot of skiing, but even the local terrain is surprisingly extensive – and you won't ski anywhere prettier. Highlights include long descents through the forest into La Giettaz and wide cruises against the dramatic and unmistakable backdrop of Mont-Blanc. You’ll remember this place. Little accommodation near the slopes. The heart of old Combloux is a genuine Savoyard mountain village, and still retains many historic features, including a distinctive onion-spired church complete with a jewel-box interior. Less immediately obvious is a preserved farmhouse which offers a time-capsule insight into mountain life in past times. Nearby are boutiques, bars and a useful range of services. The ski area, though, is considerably higher up the mountain, and served by regular shuttle buses, which pass other visitor accommodation en-route. Once up there, things are much more limited, but the vibe is both friendly and welcoming. Why go skiing in Combloux ? Skiing on this side of the valley is a back-to-nature affair, and takes some beating for anyone looking for an unspoilt natural setting. 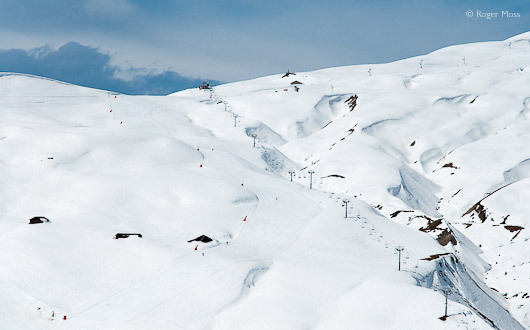 There’s also gentle, reassuring terrain for beginners, and key pistes are both wide and well-groomed. More experienced intermediates, too, will find some surprisingly long descents, including some steeps. Although we didn’t encounter too many snowboarders during our visit, it’s no reflection on the lift system, which is for the most part modern and efficient, with relatively few drag-lifts. 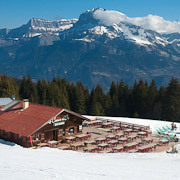 Disabled skiers are also particularly well catered-for in Combloux, which is a popular centre for adaptive skiing. Snowpark with boarder cross, jumps and beginners area. 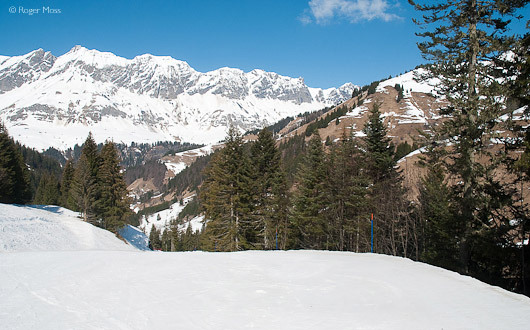 The snowpark at La Giettaz has a back-country ecological feel with entry, good and expert levels. Two loops with views to Mont-Blanc, green and blue levels. Free access. Reserved parking at Cuchet where there is a small Handiski chalet next to the piste. Accessible toilets at La Cry in the day centre at the foot of the slopes, another in the car park at Cuchet. Adapted self-catering and hotel accommodation in Combloux and nearby towns. ESF and Ski Assis Evasion have a full range of equipment and specialist instructors. 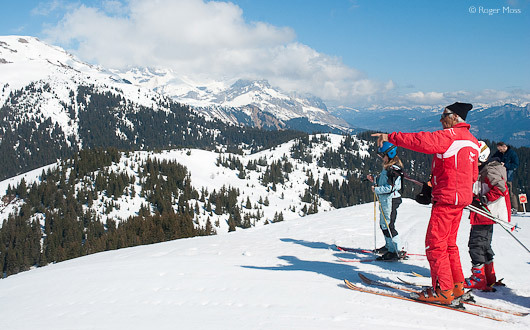 Ski Assis Evasion offer group instruction with transport. English spoken. Away-from-it-all experience amid the truly breathtaking scenery. Terrain for most tastes, with glades and some steeps. Dedicated services and facilities provided for disabled skiers. Solid value, to ski and to stay. Short transfers from Geneva flights plus convenient TGV rail connection in nearby Sallanches. Accommodation is spread out, and some, away from the shuttle-bus route, is more suited to those with their own transport. Explore the excellent terrain between here and Le Giettaz before heading to Megève and Saint Gervais. Spacious and well-equipped self-catering apartments located in a quiet location a short drive from Combloux village or the ski area. There’s an indoor heated swimming pool plus Jacuzzi, sauna and steam room (payable) and free covered parking. WiFi access (payable in reception area). Recently refurbished, all apartments at La Grande Cordee are fitted and furnished to a good standard. There’s a living area with double sofa-bed, bathroom with bath and wc and a fully-equipped kitchenette with ceramic hob, microwave/grill, fridge, dishwasher (except in studios), coffee machine and kettle. Most apartments enjoy a balcony. It’s well worth paying a little extra to enjoy amazing panoramas towards Mont Blanc from east-facing apartments on the upper floors. This is an ideal base to discover all the Evasion Mont Blanc resorts. 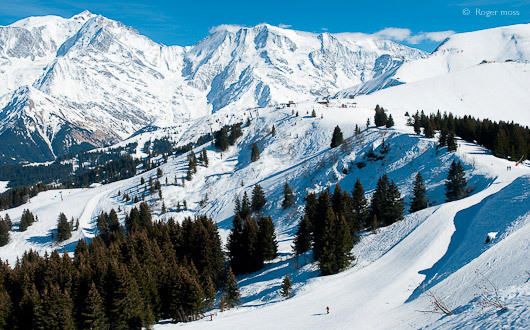 Combloux is ideally situated to visit nearby attractions such as the Mont-Blanc Tramway or the thermal spa at Saint Gervais. Chamonix is within 30 minutes drive where you could ascend the Aiguille du Midi or visit the glacier on the Montenvers train. For local activities, there's a range of guided visits and snowshoe walks. Families might enjoy an introduction to ice-climbing offered by the Bureau des Guides, all equipment provided. Open all year to offer hearty Savoyard food on a sunny terrace or in the cosy dining room with open fire. We enjoyed a calorie-laden, gratin-style dish comprising bread, delicious melted cheese sauce with morelle mushrooms. Known as a ‘croute’, it’s served with charcuterie and salad. A charming hotel restaurant in the heart of the village with sunny terrace and views to Mont Blanc. The restaurant offers Savoyard specialities with fondue starting at €16 per person. There is a good selection of starters and a choice of meat and fish main courses at around €20. From Geneva, follow the A40 l'Autoroute Blanche to Sallanches. Exit and follow the N212 direction Combloux (8km). From Albertville follow the D129 to Ugine then take the N212 through Megeve to Combloux. Turn off by the Tourist Office to access the ski area. The nearest airport is Geneva (1 hour) which can be accessed by bus or taxi. Chambéry Savoie Mont Blanc is about 1hour 15. 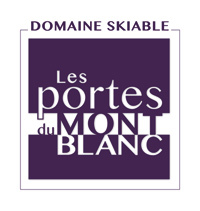 For bus connections see SAT MONT BLANC which provides links between Geneva, Sallanches, Combloux and Megeve. Or BORINI AUTOCARS do bus links between Geneva and Megeve. This couldn't be easier - travel by TGV direct from Paris to Sallanches then take a bus or taxi (8km). After a spell of exceptionally mild late-season weather we don’t have high expectations for our visit to Combloux. How wrong could we be? 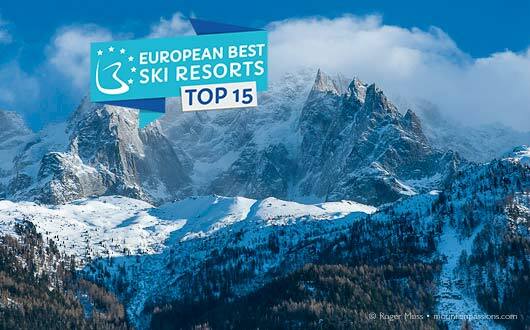 Against all the odds, this modest-sounding resort delivers the kind of skiing experience which surprises us, prompting us to add a new star-rating category (for Mountain Scenery) to our resort reviews. Skiers from Megève have access to skiing here (and several good return pistes) via the Jaillet gondola lift, which tops off at almost 1580m. Our day, though, begins at La Cry, which even at 1183m still has sufficient snow-cover to allow us to take the short Garrettes drag-lift to join those skiers electing to park higher up for direct access to the Beauregard 4-seat high-speed chairlift. The ensuing long ride, through the forest echoing with birdsong, sharpens the senses and hints at what is to come. 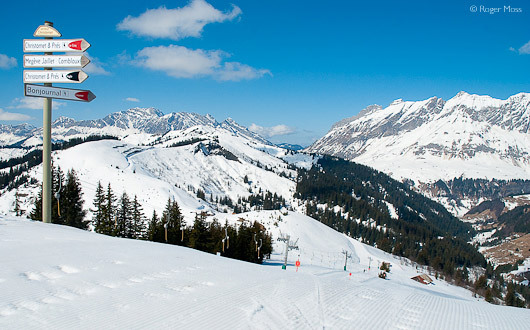 As soon as we’re back on the snow we point our skis down the Blue-graded Papa piste to pick up the Pertuis chair-lift. The ensuing long ride, through the forest echoing with birdsong, sharpens the senses and hints at what is to come. 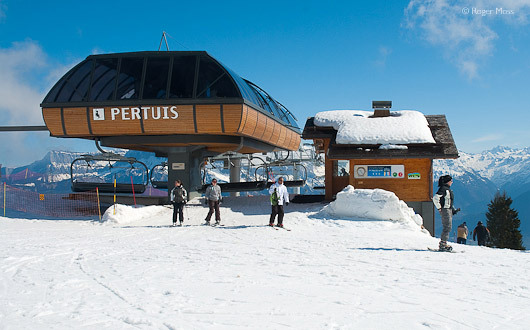 The high-speed 6-seater Pertuis chairlift whisks skiers up to 1755m. An ESF monitor points out the landmarks to a small group of young learners. The high-speed 6-seater hauls us smoothly up to 1755m, where the views across to Mont-Blanc are already spectacular. It’s also the point of departure for the exhilarating Red-graded Jorace piste, but we decide to save this for the following day and instead work our way over to La Giettaz. This means taking the gently-meandering Bel Ava Blue piste which brings us to the 6-seat Christomet high-speed chairlift for another scenic haul, this time to the 1855m summit of Le Christomet. Once again the panoramic views are mesmerising, and the ski area is starting to feel much more extensive than we ever imagined. Underlining this is the long onward Blue-graded cruise on the Tréffléannaise piste, which takes us 5km down through tracts of unspoilt forest as if we were ski-touring. Families and mixed groups looking for adaptive skiing will love this gentle, friendly ski area. Combloux is also a good village base for competent skiers who can access nearby resorts including Les Contamines-Montjoie and Saint-Gervais with an Evasion Mont Blanc lift pass. Part of the 5km-long scenic cruise down into Le Plan 1200. Eventually the villages Covagne and Le Plan 1200 come into view, and show us just why La Giettaz sector appeals to away-from-it-all fans who believe that where skiing is concerned, small really is beautiful. The long haul out, via the 4-seat Torraz chairlift when we visited but set to become much faster when this old fixed lift is replaced. As it is, the views from the 1930m summit more than repay the climb, and we tackle the return run to Le Christomet along the Blue-graded Contreverse piste (including the very gentlest of hauls on the near-horizontal Charmots drag-lift) in high spirits. The onward Blue-graded cruise on Chevreuil, followed by a run down through the tree-line on the Bouquetins Red brings us to the Coeur d’Or mountain restaurant. After the definitive relaxed lunch-break we launch ourselves back down towards the Pertuis lift, at the top of which are a couple of nearby Reds (Jorace and Porrez) served by the Jouty chairlift. Although the afternoon sun is softening things,these North-facing pistes hold up well, unlike the lower sections of the return runs back to our starting-point at La Cry. But it’s skiable, and rounds off a day on the kind of high-note which inspires us to come back for more the following morning, before heading over, as planned, to explore the Saint-Gervais sector.